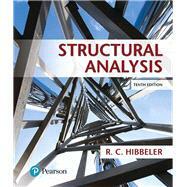 For courses in Structural Analysis; also suitable for individuals planning a career as a structural engineer. Structural Analysis, 10th Edition, presents the theory and applications of structural analysis as it applies to trusses, beams, and frames. Through its reader-friendly, clear organization, the text emphasizes developing the ability to model and analyze a structure in preparation for professional practice. The text is designed to ensure those taking their first course in this subject understand some of the more important classical methods of structural analysis, in order to obtain a better understanding of how loads are transmitted through a structure, and how the structure will deform under load. The large number of problems cover realistic situations involving various levels of difficulty. The updated 10th edition features 30% new problems and an expanded discussion of structural modeling, specifically the importance of modeling a structure so it can be used in computer analysis. Newly added material includes anupdate to the ASCE/SEI 2106 specifications, a discussion of catenary cables, and further clarification for drawing moment and deflection diagrams for beams and frames. Personalize learning with Mastering Engineering. Mastering ™ Engineering is an online homework, tutorial, and assessment program designed to work with this text to engage students and improve results. Interactive, self-paced tutorials provide individualized coaching to help students stay on track. With a wide range of activities available, students can actively learn, understand, and retain even the most difficult concepts. The text and Mastering Engineering work together to guide students through engineering concepts with a multi-step approach to problems. Also available with Mastering Engineering. R.C. Hibbeler graduated from the University of Illinois at Urbana-Champaign with a BS in Civil Engineering (majoring in Structures) and an MS in Nuclear Engineering. He obtained his PhD in Theoretical and Applied Mechanics from Northwestern University. Professor Hibbeler’s professional experience includes postdoctoral work in reactor safety and analysis at Argonne National Laboratory, and structural and stress analysis work at Chicago Bridge and Iron, as well as at Sargent and Lundy in Chicago. He has practiced engineering in Ohio, New York, and Louisiana. Professor Hibbeler currently teaches both civil and mechanical engineering courses at the University of Louisiana— Lafayette. In the past, he has taught at the University of Illinois at Urbana-Champaign , Youngstown State University, Illinois Institute of Technology, and Union College.